Introduction: The growing evidence has verified the survival benefit of combined treatment of the chemotherapy followed by the surgery for advanced thoracic esophageal cancer. The endoscopic surgery for thoracic esophageal cancer has been shown to facilitate the early resumption of daily activity of the patients in the postoperative course, but is considered technically difficult especially for the patients pretreated with the chemotherapy. We sought to elucidate the clinical significance of the endoscopic surgery for thoracic esophageal cancer after neoadjuvant chemotherapy. Methods: The clinical records of the patients with thoracic esophageal cancer after neoadjuvant chemotherapy followed by the endoscopic surgery at our institution during January 2007 to July 2009 was reviewed retrospectively. The endoscopic surgery included subtotal esophagectomy with D2 lymph node dissection and esophageal reconstruction. The comparison was made between Group A (with neoadjuvant chemotherapy combined with 5-FU and CDDP, total 17 patients) and Group B (surgery alone, total 11 patients) by the statistical analysis with either Mann-Whitney U test or chai-square test (Dr SPSS). The p-value below 0.05 was considered statistically significant. Results: The mean age was 65 years old and the male/female ratio was 15/2 in Group A. There was no significant difference for operation time (665 vs 685 min, p=0.605) and blood loss (281 vs 169 ml, p=0.57) between Group A and B. The postoperative morbidity in Group A and B was as follows; recurrent nerve palsy (2 vs 0 case), anastomotic leakage (1 vs 0 case) and respiratory diseases (4 vs 5 cases). The mean postoperative hospital stay in Group A was 27 days but the difference was not statistically significant compared to Group B (17 days, p = 0.72). Conclusions: The postoperative outcomes of the endoscopic surgery for thoracic esophageal cancer after neoadjuvant chemotherapy included trend of more frequent occurrence of morbidity and prolonged hospital stay compared to those of the endoscopic surgery alone but no mortality. 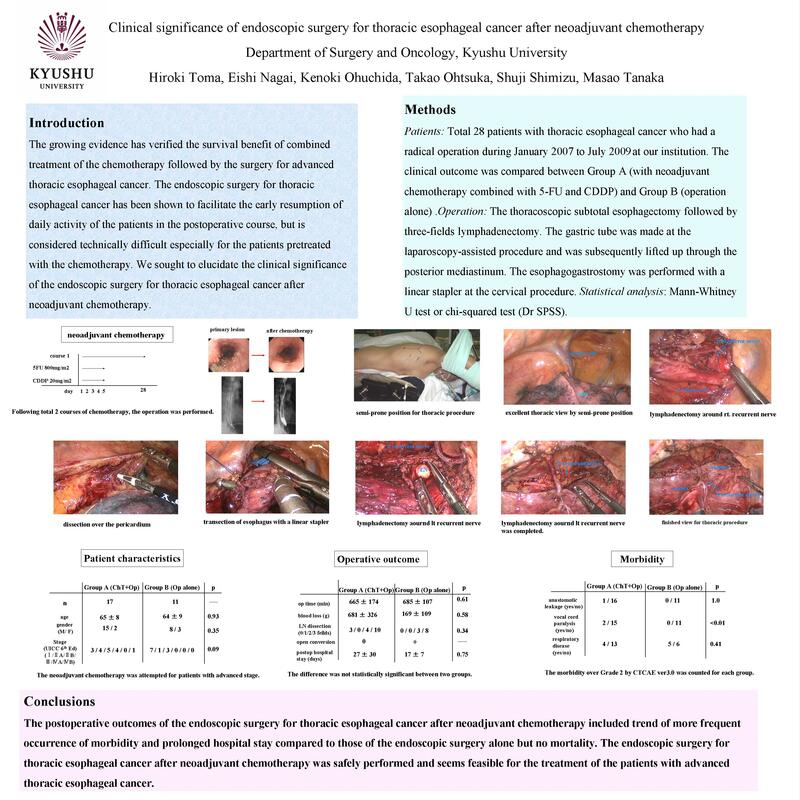 The endoscopic surgery for thoracic esophageal cancer after neoadjuvant chemotherapy was safely performed and seems feasible for the treatment of the patients with advanced thoracic esophageal cancer.